I have JD 970 that I just purchased. The tires have been ballasted with water and anti-freeze. I note that the book says to measure the tire pressure of ballasted tires with the valve stem at the bottom of the tire but notes a special guage is needed. The dealer/salesman says to measure the pressure with the stem up. His comment is that this is where the air is. A nagging memory of a science class is telling me that the pressure will be the same either way. The simplest ought to be with the valve stem up. Why would the book say valve stem down? FWIW, my JD manual doesn't specify a particular orientation. Pressure wise I don't think it matters. I always check my filled tires with the stem up to minimize the amount of fluid that may squirt out. You should use a gauge that is approved for fluid filled tires. I bought mine at a nearby auto parts store for something like $8, but I live in a rural area. Stores in less rural areas may not carry them. Toller, the salesman would be correct if you needed to measure the air charge. What you need to know is the total pressure on the tire. This is what affects load-carrying, ride, etc. Since water alone is ten pounds per gallon this must be taken into consideration also. Calcium raises this even further. Thus the valve must be at the very bottom to get the 'whole picture'. If it was just air, it wouldn't matter for the few feet from top to bottom of the tire, but for a dense substance like water, even a few feet difference vertically will show increased pressure at the bottom. So it doesn't matter if you measure 4 ft deep in a lake or at the bottom of a 4 ft diameter tractor tube, the increase in pressure would be the same. Hey, learn something new every day here! Ok, I didn't know that there were special gauges for fluid filled tires, so that was good new info. I'll have to look for one just for good measure, but I still like the idea of measuring just the air at the top. 2.31 feet of water = 1 psi. Calcium would be more dense, so it would exaggerate the effect. If you know the approximate height of water in the tire, why not just add the difference? For the 4 ft high tire example, 4/2.3 = 1.7 psi. Is 1.7 psi going to make that much difference? My old stick type gauge isn't that accurate. The Service manual calls for 20 psi in rear tires, so we are talking about around 10% variance. 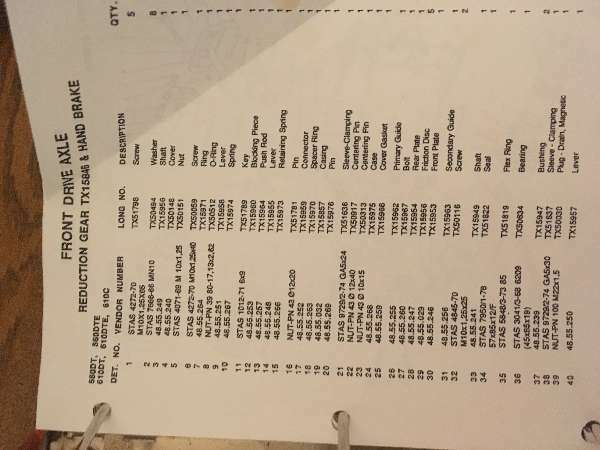 The Orange service manual for 7800, 2410, 2710, 2910 doesn't say anything about stem position that I have found. I agree. This isn't a nuclear submarine. All my manuals refer to air pressure, not water pressure. Air is at the top.... measure it there. "THE BOOK says to measure the tire pressure of ballasted tires with the valve stem at the bottom of the tire..."
If the tire is more than a foot in height then the pressure at the bottom of the tire, contacting the soil is different than the bottom. You might as well measure the top and calculate the difference.